I’ve been sharing free printable lunch box jokes for a few years now, including all the major holidays, and other fun themes. 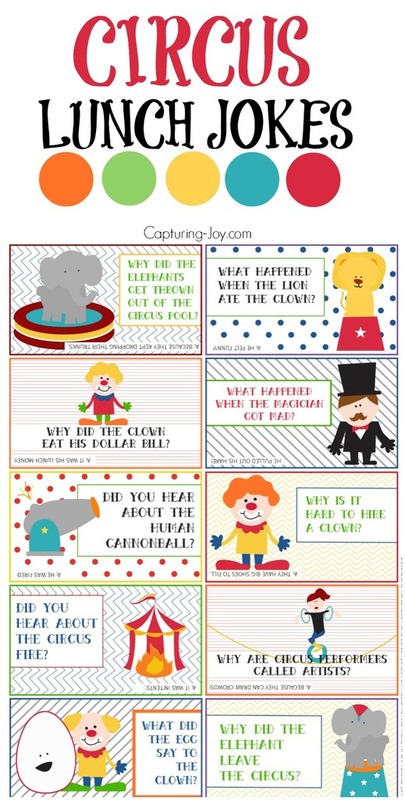 Today, I’ve got a set of Circus Lunch Box Jokes that are sure to delight both your kids and/or significant other! I’ve had people tell me that they like to slip them in their husbands lunch, if they don’t have kids. I love it! It’s just a simple way to show a little love when you are apart. Even if they don’t make it into a lunch, you can hide them in the kids rooms or hang them on a bathroom mirror. The options are endless. Have you printed the jokes in the past? Do you have a favorite set? If you haven’t seen the others, head on over to the Lunch Jokes section of my site to see them and all choose others to print. I like to print out a few sets at a time (for each child) and keep them in a drawer in my kitchen, to easily slip them in each day. Not only do my kids love them, but their friends and even some teachers will stop by the lunch table to hear the joke of the day!